In 2018, the Office for Problem Gambling (OPG) released new gambling harm minimisation signage. 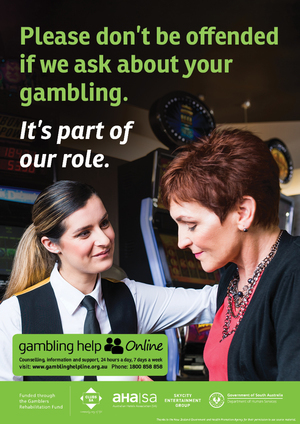 The new signage was aimed at informing patrons that venue staff are trained to assist those who may be experiencing difficulty with their gambling, and that they should not be offended if staff approach them for a discussion around their gambling as it is all part of their role. In order to assist OPG in evaluating the effectiveness of this signage, we would like to encourage all licensees, gaming managers and gaming employees to partake in a short online survey. The aim of the survey is to determine whether the signage has had an impact on engagements between staff and patrons, and examine other ways that the message that staff can help patrons experiencing gambling problems can be conveyed.